Last week, I went off a bit about the structural problems that bedeviled The Doomsday Scenario. Let me add another one to the list here: the structure of the crossover, in which Dredd solves the problem overseas and then comes back home and solves the problem we thought DeMarco might take care of, suggests that he's not just a particularly tough member of a police force, but such a badass that everyone and everything in his orbit is helpless without him. As it stands, he's the person who more or less singlehandedly resolved the Apocalypse War, Necropolis, and half a dozen other citywide or global catastrophes. The way Doomsday is set up, MC1 falls to Narcos's robots in a matter of hours (John Wagner pretty much admits via caption that it's not really a robot war, more of a robots-do-their-thing-for-a-little-while), effectively because Dredd's briefly not around. Then Dredd leads the expedition that pulls off the decisive "oh hey let's reprogram the robots" move, and boom, as soon as he comes back to the city, his team wins. That seems like overdoing it, somehow. 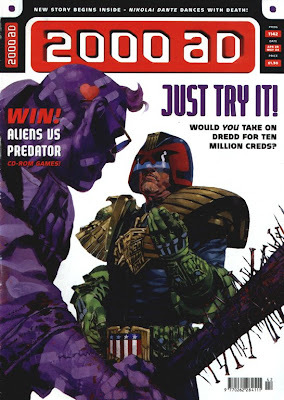 Doomsday for Dredd also suffers from multiple-artist syndrome even more than... most long Dredd storylines that aren't anchored by Carlos Ezquerra. Cam Kennedy's opening sequence (published as "Return of the Assassin") looks fantastic, of course. But then we shift to the trial sequence, drawn by Simon Davis with a post-Barron-Storey scratch-and-splatter technique unlike anything the series had seen before (aside from some of John Hicklenton's work, maybe): it's a plot-heavy set of episodes, and Davis's habit of throwing in a few vague pen lines behind his characters and calling it a background means they lose a lot of the force they could have had. I do like that Davis draws one member of the Direktorate to look just like Wagner, though. By then, though, the story's gone off the rails. 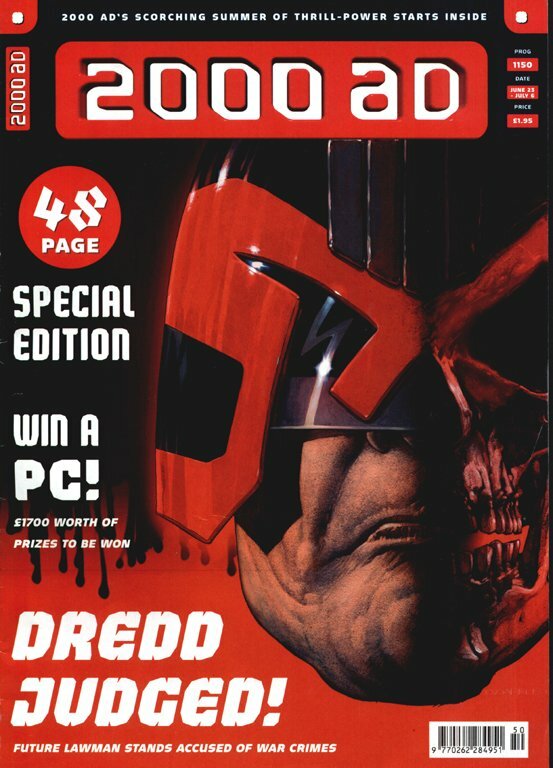 I appreciate the idea that Dredd's annihilation of East-Meg One would have long-term consequences (an idea that Wagner would do much more and much better with later on)--although it's odd that the survivors would have waited fifteen years to put a price on his head. But the trial sequence at the core of Doomsday for Dredd is based on a ridiculous bit of handwaving. For one thing, it's never been explained what the Sovs hoped to gain by invading and bombing MC1 back in "The Apocalypse War"--and this would be a particularly good time for it, since Narcos is basically doing the same thing. For another, it's in no way evident that Dredd had to wipe East-Meg One off the map: even if he hadn't killed the city's leaders and destroyed its offensive capabilities, nuking the entire city always seemed more like revenge, or even just pique, than anything resembling justice. Putting him on trial for war crimes actually seems entirely reasonable; note that Anderson's key question to Orlok--"From your knowledge of the situation, was there any other way the East-Meg invasion could have been repelled?" --begins with a touch of weaseling. One virtue of "The Apocalypse War" as a story is that Wagner and Alan Grant kept cranking its stakes and tension higher and higher. 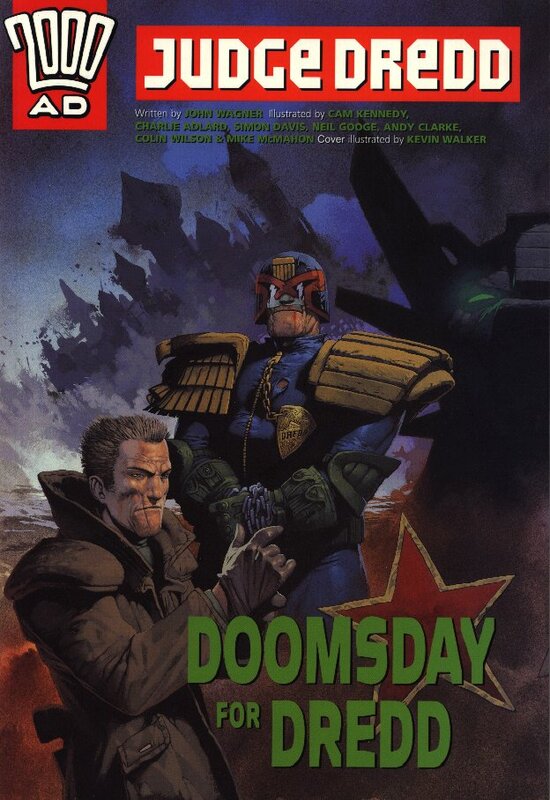 But from the moment Dredd and Anderson escape the New Kremlin--which Dredd apparently destroys altogether by blowing up a couple of propane tanks, since otherwise there'd still be a bounty on his head--the air slowly leaks out of Doomsday. Rutherford's plan a few chapters later is entirely sound, and nothing interferes with it, which means that we spend the "War Games" sequence just watching it play out, with the only drama supplied by a couple of previously unknown-to-us Judges getting iced. And once we move back to MC1, with the reprogrammed robots cleaning up the mess, the plot goes flat altogether. Narcos, Wagner tells us, hasn't really figured out what he's going to do with the city once he's conquered it; hell of a time to let on to that. The last 30 pages of the story are just Narcos losing, progressively, with a lot of explosions thrown in. 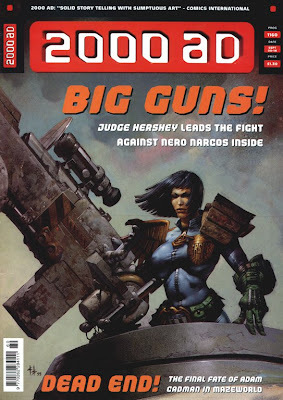 I wonder if Hershey's top-billed appearance on the cover of Prog 1160 (in a Greg Staples-painted cover, below, for which she seems to have gotten temporary implants) means that she was originally supposed to have a bigger role in "Endgame"--the role she actually has is one panel in that issue, with four words of dialogue. Most of "Endgame" is trumped-up story beats that reverse themselves as quickly as they appear. Edgar's in terrible trouble!--oh no, wait, Edgar's fine. Narcos has come out to face his fate!--And his fate arrives in the form of Dredd, showing up to save the day again (why does Dredd have to go to meet him? couldn't the other Judges on the scene just go ahead and shoot him?). But Narcos might have sent a decoy!--oh, actually he didn't. Okay. Pow. Story's over now. That's a shame, because in its initial sequences, "Doomsday" has a lot of promise. I really love the opening scene, with Orlok biding his time and working with the sweet little aliens who don't quite understand the import of what's going on. "You could be salving your lips with them right now" is a terrific line. Dredd doing a crime swoop to calm his nerves, Orlok and the sleeper agent, Brit-Cit making a big show of not helping MC1 and then immediately turning around and offering assistance: all good stuff. 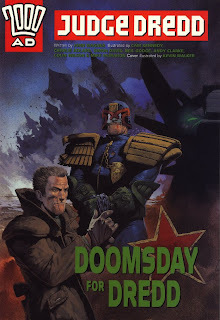 In its outline, the 2000 AD part of "Doomsday" seems like a great idea--a crimelord making his move for control of the city, the Judges brought low by their own technology, Dredd on trial for his role in the Apocalypse War and being defended by Orlok. It's not clear, though, that Wagner figured how to get the story past those exceptional situations before there was no option left but to brute-force its way out of them. 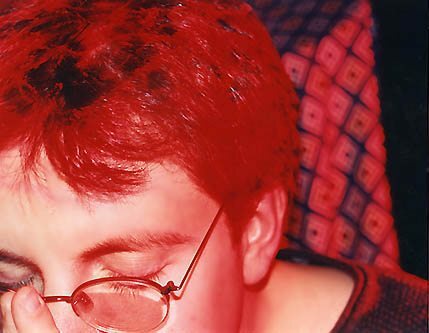 Next week: the amazing Mr. Lev Grossman joins me to discuss Devlin Waugh: Red Tide! I was going to re-read DOOMSDAY along with you, but it's such dispiriting stuff I can't be arsed. It's difficult to imagine how this could have come from the same writer that only a few years earlier had given us THE PIT. To my mind, it's the epic that proved to Wagner that there was no mileage left in those Destruction Epics (Garland's term) of old. NECROPOLIS felt like the logical conclusion and should have been the end of that cycle of stories. With THE PIT and AMERICA amply demonstrating the two poles between which future major Dredd stories should have (and would eventually) swing, it seems odd to return to that kind of narrative, especially when (as you point out) forcing Dredd to confront and account for his genocide could have been the basis of a decent (shorter) story sequence. 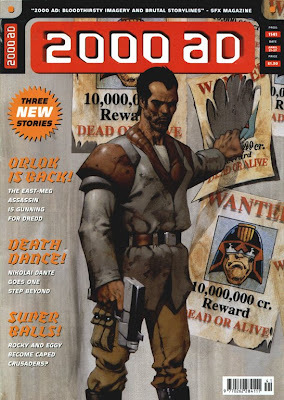 I wonder if editorial weren't pushing for another high profile epic to bolster sales that were, at that time, falling toward cancellation territory? There's a lot to recommend in the early 21st century stories that followed DOOMSDAY, but I think it's telling that most of them were smaller in scale and focus, and that it wasn't until the recent DAY OF CHAOS that Wagner felt he had anything new to bring to the existential threat to the city/rule of the judges narrative. You have to ignore the brilliant TOTAL WAR to make that shoe fit, though.